HEN THE EXPLANATORY EMAIL ARRIVED the other day, I was very pleased. In the memo, the Office for Liturgical Music of the Archdiocese of Philadelphia announced its new “Basilica Music Academy,” basically a summer school for church musicians. This summer school, however, is not punitive, but voluntary, designed to further, broaden, and polish the parish musician’s skills. It will be based at our Cathedral Basilica of Ss. Peter & Paul. What will they offer? The curriculum focuses mainly on voice and organ lessons, with the option for private or semi-private (two or three people) sessions. The emphasis of the vocal studies will be technique and sacred repertoire, both solo and choral. 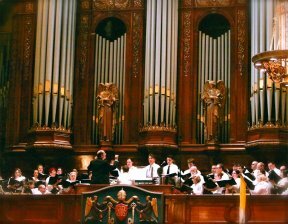 For organists, the instructors will focus on playing technique, service playing, improvisation, and repertoire. The Basilica Music Academy is just the newest development in the music department of my home Archdiocese. There are several other recent improvements for which Dr. John Romeri, Fr. Dennis Gill, and our worship office staff should be highly commended. Begun in 2011, the “Concerts at the Cathedral” series has brought an impressive string of national and international artists to perform in our cathedral, which is a magnificent acoustical space. The Association of Church Musicians in Philadelphia (ACMP), which has existed for many years, has been gaining momentum and undergoing serious renewal that is benefiting its membership in extraordinary ways. Furthermore, Philadelphia has long sponsored an Archdiocesan Boys Choir, but we now boast also an Archdiocesan Girls Choir and an adult Archdiocesan Choir. If you live in the Philadelphia area, or if you are simply interested, click here for a flyer with more information on the new Academy. Good things are happening musically here. We still have a long way to go toward reintroducing chant to our parishes, but some foundations have been laid for a renewed appreciation for music that is truly sacred. Are similar things happening in other Dioceses?